33 with the left hand, arc down, holding it with the right hand telescope down. In case the head is in the way another prism, reflecting the ray at right angles, is inserted in the eyepiece of the telescope. This instrument is especially adapted to measuring large angles as there is no confusion or multiplicity of images. Both the direct and reflected images appear plain and distinct in all positions of the index glass. 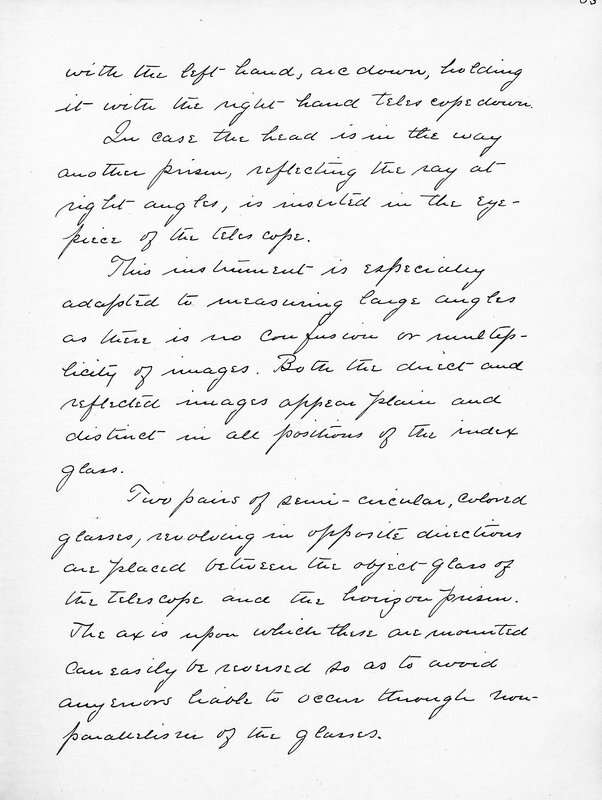 Two pairs of semi-circular, colored glasses, revolving in opposite directions are placed between the object glass of the telescope and the horizon prism. The axis upon which these are mounted can easily be reversed so as to avoid any errors liable to occur through non-parallelism of the glasses.